The ministry of A. A. Allen was clearly one of the fathers of faith, a revivalists to emerge in the early days of the healing revival and was one who ploughed on with grass-roots healing revivalism for over twenty years until his death in 1970. Born in Sulphur Rock, Arkansas, in 1911, he grew up with an alcoholic father and an unfaithful mother who lived with a series of men. “By the time I was twenty-one,” recalled Allen, “I was a nervous wreck. I couldn’t get a cigarette to my lip with one hand. . . . I was a confirmed drunkard.” (Lexie Allen, God’s Man of Faith and Power, p57, 1954). Two years later he served a jail sentence for stealing corn in the midst of the depression and thought of himself as “an ex-jailbird drifting aimlessly through life.” It was at this point that Allen was converted in a “tongues speaking” Methodist church in 1934He met his wife, Lexie in Colorado and she became a powerful influence in shaping him for his future ministry. Licensed by the Assemblies of God as a minister in 1936 began an effective evangelistic ministry at a small church in Colorado. After a two year pastorate he spent four-and-a-half years during World War II, as a full-time revivalist. He was the worship leader, musician and preacher but low finances and mediocre results took their toll on this father of four children. He left the itinerant ministry in 1947 when he was offered the security of a pastorate in a stable Assemblies of God church in Corpus Christi, Texas. Back in Texas, when his church board refused to sponsor a radio program, he resigned and began conducting revivals again with the hope that he too might develop a major healing ministry. In, He sent his first report to The Voice of Healing in May 1950, from Oakland, California, “Many say this is the greatest Revival in the history of Oakland” in what was to become typical AAA style. Observing the burgeoning ministry of others he noticed that the evangelists who were drawing the largest crowds were doing so under canvas. In the summer of 1951 joined the ranks of the tent ministries giving a down payment and commitment to pay off the remaining amount as the ministry grew – and it did. 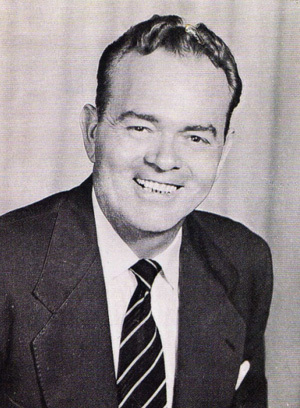 He established his headquarters in Dallas and in 1953 launched the Allen Revival Hour on radio. He conducted overseas campaigns in Cuba and Mexico regularly, and by1955 was broadcasting on seventeen Latin American radio stations as well as eighteen American ones. Allen’s sanguine personality expressed itself in his enthusiastic reports, unparalleled showmanship and startling miraculous claims. He was a persuasive preacher, with a compelling presence and unusual empathy and rapport with the common people. He preached an old-time Pentecostal message with consummate skill. His message of holiness resonated in the hearts of those reared in austere Pentecostalism. His stage presence and theatrical approach endeared him to the economically deprived working class and also to black communities. Ever the showman he made religion enjoyable and church-going fun. But, above all, it was the power of God which attracted the huge audiences over the years. Thousands were converted in the midst of dramatic public healings and deliverances from evil spirits. Nothing was ‘done in a corner’ but all was employed to support the message that Jesus was alive and interested in the needs of ordinary people. A. A. Allen considered himself the most persecuted preacher in the world. The Assemblies of God were not happy with his apparently questionable, or at least exaggerated, claims. His readiness to publically counter-attack his accusers brought a continual stream of criticism and alienation from mainline Pentecostals. But the accusation that he drank abusively was the straw that broke the camel’s back. 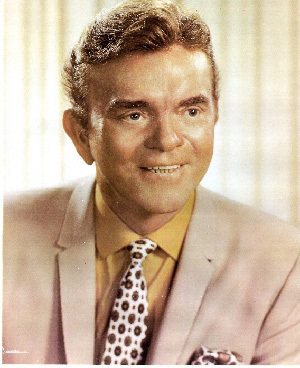 In the fall 1955, he was arrested for drunken driving while conducting a revival in Knoxville, Tennessee. The local press took the opportunity to attack and expose Allen and the beleaguered minister forfeited his bail rather than stand trial on the charge. Gordon Lindsay felt that the Voice of Healing had to take “a strong stand on ethics.” Allen resigned from the group, pre-empting their imminent dismissal. He immediately began publishing his own magazine, and, although he affected a cordial relationship with his former colleagues in the Voice of Healing, feelings remained strained. Interestingly, as other ministries were struggling and the revival was waning, Allen’s charisma and ministry skills coupled with well-staged revivals and an amazingly gifted team, enabled him to re-establish his ministry and rebuild a substantial and effective work. Miracle Magazine was resounding success. At the end of a year’s publication in 1956, it had a paid subscription of about 200,000,and, according to Mrs. Allen, was “the fastest growing subscription magazine in the world today.” In 1957, Allen began conducting the International Miracle Revival Training Camp, an embryonic ministerial training centre. In 1958, he was given land in Arizona where he began building a permanent headquarters and training centre. At the height of the 1958 crisis in the revival, Allen announced a five-pronged program for his ministry: tent revivals, the Allen Revival Hour radio broadcast, an overseas mission program, the Miracle Valley Training Centre, and a “great number of dynamic books and faith inspiring tracts” published by the ministry. 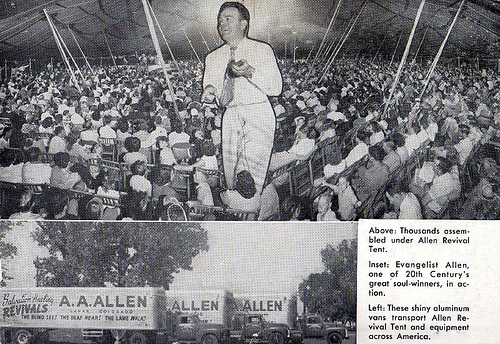 In 1958, Allen purchased Jack Coe’s old tent and proudly announced that he was moving into the “largest tent in the world.” His old-time revivalism, up-beat gospel music and anointed entertainers continued to attract the masses. Allan died at the Jack Tar Hotel in San Francisco, California on June 11, 1970 at the age of 59. Some claim that Allen died an alcoholic because the coroner’s report concluded Allen died from liver failure brought on by acute alcoholism. Others know that he had battled with excruciating pain from severe arthritis in his knees, for over a year. It is true that Allen had undergone surgery on one of his knees and in June of 1970, was considering surgery on the other knee. They believe that the Coroner’s Report of “fatty infiltration of the liver” was a result of the few times he used alcohol in his last days to alleviate the excruciating pain of his arthritis. Whatever is true of his death the life of A. A. Allen was one of extraordinary commitment to Jesus Christ which brought victory over the enemy of mankind. A. A. Allen was a true survivor. Even though the revival was declining in the late 1950’s and 1960’s his commitment to old-time faith-healing campaigns ensured the continuing testimony of signs and wonders to the next generation. He may have had his personal ‘quirks and foibles’ but the testimony of thousands of the blessing they received, the enduring love for God that resulted and the demonstration of the power of the Gospel are good reasons to give God thanks for such an amazing life! Bibliography: D. Harrell, Jr., All Things Are Possible (1975); Art: S. Shemeth, International Dictionary of Pentecostal and Charismatic Movements (2002).